Wyoming has several species of rabbits and hares. First, what is the difference between rabbits and hares. According to several websites, hares give birth to offspring that are covered with hair and eyes that are open. There is no nest and the young can run (hop?) within a few minutes of birth. Rabbits are born blind, hairless and helpless. They are born into a nest and require the mother to protect them. Cottontail rabbits are a small rabbit with a fluffy white tail (hence the name) Most of the rabbits I've seen in Wyoming look like desert cottontails. They have a brownish patch behind the neck on their backs. These rabbits weigh around two to three pounds Rabbit life spans in the wild are short--most sources say less than three years. Some websites put the number even lower. Since rabbits are food for raptors, foxes, wolves and people, it's quite likely their lifespan is short. In Wyoming, Game and Fish lists eastern cottontails, desert cottontails and pygmy cottontails as species found in Wyoming. Pygmy cottontails are extremely small rabbits--under one pound and six or seven inches in length. They are listed as a species of concern. These are the only rabbits in Wyoming that dig their own burrow. Their diet consists almost exclusively of sagebrush. Plus, pygmy rabbit are generally found at elevations of 6500 to 7500 . There has been at least on study ongoing for three years but further research is needed on these rabbits to know how adaptable they are, what their habitat requirements are, the population distribution, etc. I have not seen any pygmy cottontails and thus have no photos. Jackrabbits are fairly large animals--up to 2 feet or more in length, weighing 3 to 9 pounds. They are hares, not rabbits. They re capable of running 40 mph, in a zigzag patter and leaping (or some call it bounding). Until we bought our ranch land, most of the jackrabbits we had seen were in motion, bounding away at high speed! Also, until two years ago, I have not seen any black tail jackrabbits. Admittedly. seeing the tail color of a bounding jack rabbit is difficult. The critter has to be moving slowly or not moving at all. 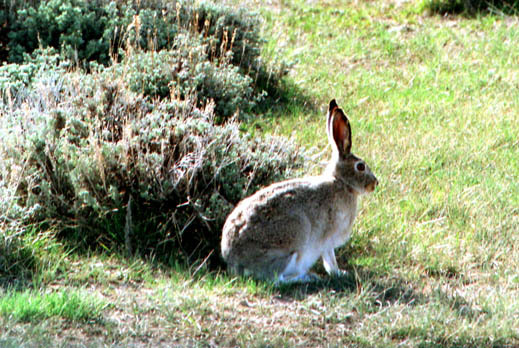 The black tailed jackrabbit was seen near Casper. Jackrabbits change color with the change in seasons. In the summer, they are a gray/brown color. In winter, the rabbits turn mostly white, except the tips of the ears. 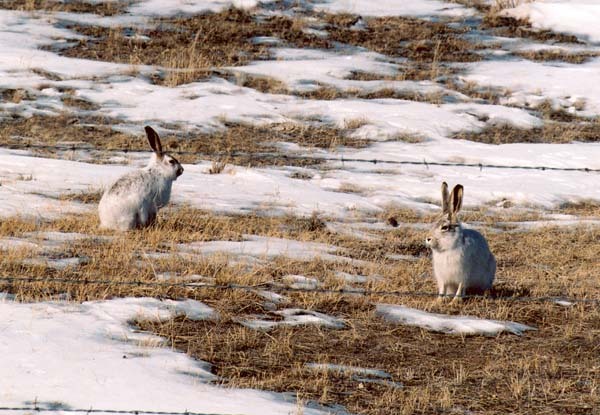 Wyoming also has snowshoe hares, which I have not seen. These hares live high in the mountains and are fairly solitary creatures. Their coat turns a white color in the winter to help camouflage the rabbits. Cottontail and jackrabbit populations rise and fall in a cyclic fashion. (My research indicates this is not unique to Wyoming.) Right now, the population appears to be falling. Three or four years ago, there were six to ten rabbits visible, whenever I went out in my yard. Now I see one or two. The cycles do not seem to affected by hunting. One theory is the cycles are related to disease in the rabbits. In Shirley Basin a friend observed many dying and dead jackrabbits this year, apparently due to disease. She also has had huge numbers of jackrabbits congregating on her property each winter. Cottontails live close to humans and often lose any fear of humans. They can be observed in cities and towns living in yards, alleys and parks. Unfortunately, living in town means the rabbits will eat landscaping, and in rural areas they munch on crops. This makes them unpopular with farmers and those who value their landscaping. I have noted the the "cuteness" of cottontail rabbits provides a degree of protection from human wrath. "They're just sooo cute!" is often said. Jackrabbits do not seem so gregarious. I have had only a small number come up close to my house. There are a couple near our cabin that come close, but there's not much human activity in that area. Even then, the jack runs if we get too close to him and would never set on the steps outside the cabin, as the cottontails do here. Our ranch area has mostly jackrabbits. Cottontails are rare, and I am not certain why. No discussion of rabbits in Wyoming would be complete without covering jackalopes. The town of Douglas is the apparent origin of the jackalope myth. According to the Converse County web page (Douglas section) Douglas Herrick created the first jackalope in the 1930's a chance dropping of a rabbit carcass next to a pair of deer antlers in a taxidermy shop lead to the creation of the jackalope. I found many websites dedicated to the myth and legends of the jackalope. I have often wondered why the name "jackalope" came up when the creation actually has deer horns in most cases. There is a statue in Douglas that features antelope horns, which seems more appropriate. Sources: "The Who and Why of Rabbits", National geographic website, MSN website and the Converse County Wyoming website.